Nancy Cartwright — the legendary voice of Bart Simpson — used to conduct voice-over workshops on a regular basis (she is focusing more on charitable fundraising and other causes now) — the people who would flock to the workshops (which were expensive and had massive waiting lists) were those who saw the performing of animation voices as the penultimate genre in voiceover in which to work — and being the voice actor behind a well-known and beloved character (such as Bart Simpson) is the fantasy of many. The income that the Simpsons actors must be amassing…..not to mention the unheard of job security and the unusual fame of being able to walk the streets and not be recognized — until you open your mouth — is amazingly alluring. As indisputably great as it would be to voice a major character on a long-running animated feature, my “Dream Jobs” — those elusive voice-over jobs I’d give my eye teeth to do (providing it didn’t interfere with my diction) — are slightly different than most aspire to…and are likely more offbeat. …but think about the last time you heard a female voicing a movie promo trailer. I think maybe once…at an art-house style theatre, I believe I heard a promo for an indie movie voiced by a female. That’s a rarity. When Don La Fontaine, “The Movie Trailer Guy” passed away in September 2008, he left behind him a firm reputation as the quintessential and unmistakable Movie Trailer Promo Voice — and even though a colleague and close friend of his — Joe Cipriani — seems to have taken up the reins in voicing trailers, La Fontaine’s tones will always be identified as the voice who “owned” that genre. The creative department at NatGeo can be considered to be the Fort Knox of documentary production — if there’s a way to get your demo in there, I have run out of ideas about how to do that. It’s a very protected, insular division; the powers that be who would give demos a listen are closely guarded and anything but transparent, and on those occasions that I have hunkered down and decided to make a big pot of coffee and make a day of researching the right contact to approach, (and it is a full *day*) I have come up empty-handed. I believe I have just the right tones to describe the Coral Reefs; the life-cycle of the Giant Sea Turtle; the Greater Kudu of the Ocavango. Why don’t they let me? This has still alluded me despite my best attempts at signing on with the best agents, whose sole purpose is to position me correctly and place me directly in line with the Coca-Colas and BMW’s of world, looking for a long-term and identifiable voice for their product. (Agents are whole other blog I’ll tackle soon…). Most voice talent dreams of such a contact — a colleague of mine was the voice of Toyota for a few years, and put him on the map as a major hitter. I was the national voice of Canada Safeway for a number of years — a great contract to have, and one which demanded a lot (virtually no vacation time was allotted; one had to be available for re-records at a moment’s notice; grocery prices vacillating much like commodities). I’d love to have big, knock-it-out-of-the-park national contract again, and feel fairly confident it’s within my grasp. I would never wish to whisk this job away from esteemed colleague Randy Thomas — who has voiced both the Academy Awards *and* the Tony Awards for years — these juicy contracts are her claim to fame, and she never ceases to amaze me with her calm and fluid pronunciations of (sometimes) the world’s trickiest names (think “Best Foreign Film” category) — and in a pressure-cooker of an environment. However, if she were ever to abdicate her throne…I’d gladly take over. Rubbing elbows with the famous, and the most widespread exposure any voice talent could hope for. An amazing contract which she does expertly. None of the above musings should be taken as discontentment in the least: I am blessed with rewarding, steady, and fulfilling work for a wide variety of exceptional clients…it’s just always good to dream, to speculate, and to covet that irresistable contract which is just outside of your grasp. Next blog: I’ll delve deeper into the genre of the On-Hold System……we hear them almost every day, and being in the position of voicing several a week, I can contribute my two cents about what I thinks makes a *great* on-hold system, and why many are simply a trial to listen to. Imagine retrieving your mail from your letterbox and noticing that all envelopes have been ripped open, and sloppily re-sealed with a sticker reading: “This mail has been opened and inspected for quality control and training purposes”. Imagine even more bizarrely: not even caring about that and even accepting this as a normal function of doing business with the post office, or with the company which sent you the letter in the first place. And it’s true: quality control is still a large component and reason behind call recording technology — it’s a great way to gauge performance of workers, to track efficiency, and head off problem/ineffective employees at the pass. Consider, though, the more self-protective aspects which primarily drives firms to implement call recording: to insulate the company from lawsuits. Audio evidence that their employee behaved appropriately, accurately, and legally — is invaluable. What used to be an “our word against theirs” scenario can easily be reviewed, analyzed and verified. More sinister, though, is the use of carefully planned and executed information-gathering techniques by call-center staff which can be recorded, reviewed, and analyzed for demographic and marketing purposes. Information freely divulged by the caller about their income, their spending patterns, how often they call, and their general perception of the company, can also be elicited by well-placed questions on the part of the call-center agent — providing useful feedback from the customer, given somewhat unknowingly and unsuspectingly; recorded and preserved for posterity. All but 12 US States — and Canada and the UK — require only one-party notification (meaning that only one of the party on a two-party call needs to know the call is being recorded). In all other areas, “consent” must be given by callers by hearing the recorded disclaimer, and the continuation of the phone call indicates their compliance. An automatic tone must be repeated at regular intervals throughout the call, occurring every 12 to 15 seconds and must be audible to both parties. 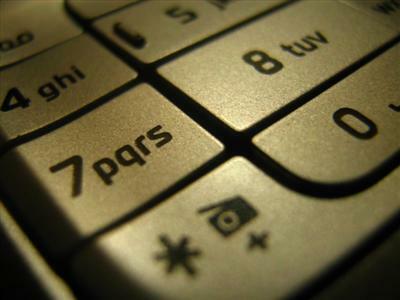 What can you do if you are not completely comfortable with the idea of having your call recorded? You can request that the recorder be turned off, or elect to contact the company in an alternate method. Chances are, you will weigh the cost of having the matter take up even more of your time by writing them a letter instead; like our ever-expanding transparency and our ever-shrinking entitlement to privacy, chances are you will tolerate a brief recording of your personal traits if it will resolve your issue and allow you to tackle others. Or — like the ever-growing number of surveillance cameras we encounter on daily basis or the accessibility to your information via social networking sites, you likely don’t give a second thought about how much of your information is out there, and to what end it’s being used. Nobody would stick around for all that. It’s best to keep your call brief, to the point, and don’t divulge any more than what’s necessary. Next blog: I’ll be writing about my “Dream Jobs” — projects which I aspire to voice at some time in my career. Just sending it out there…! Harlan Hogan is a well-known voice actor, and a published author of many books about the building of and recording from your home studio — two must-reads for any home-based talent is his “The Voice Actor’s Guide to Home Recording” (2005, Thomson Course Technology Press) and its more recent follow-up, “The Voice Actor’s Guide to Recording at Home …and On the Road” (2009, also Course Technology Press). He is a pioneer of the idea of the “portability” of recording; and has recorded voice-over projects in various hotel rooms across the world (and even the occasional quiet, parked car) — and has even gone so far as to design and market his own “Harlan Hogan Porta Booth” — a collapsible mesh cube which is fitted with pre-cut pieces of accoustical foam; beautifully lightweight, portable and a welcome alternative to maniacally building an ersatz fort out of hotel pillows and sheets. (Which he is *also* expert on). 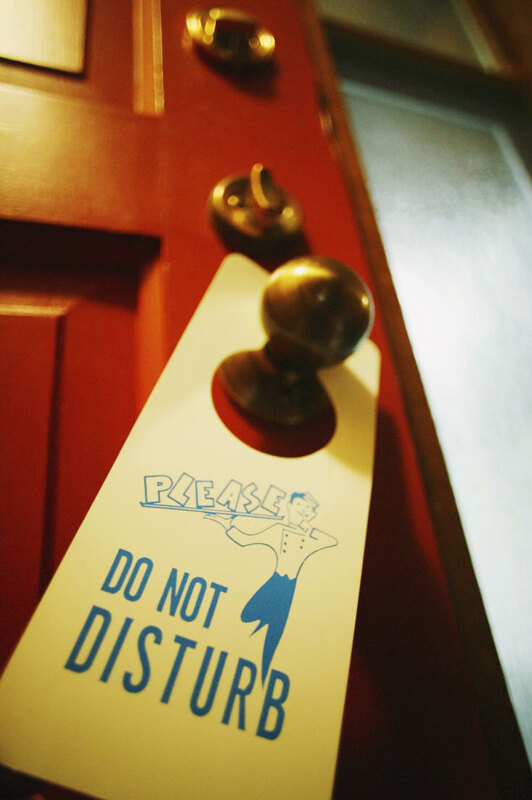 He even confessed in a podcast to accumulating “Do Not Disturb” hangtags from every hotel he’s stayed in, and festooning all doorknobs of nearby rooms with them — in order to keep the cleaning staff and their whirring vacuums out of his recordings. Much to the chagrin of fellow hotel guests, wondering why their rooms were never cleaned. 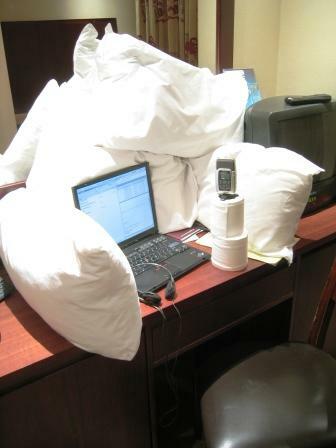 I, too, decided to give hotel room recording a try last summer during a brief few days off in Vegas — granted, a city not known for its peace or serenity, and likely the very worst locale in which to try out the idea of remote recording. I had purchased the Snowball Microphone (made by Blue Microphones — thought to be one of the most durable, portable and best Podcasting microphones) and installed my usual sound editing programs on my laptop — I was all set! Then, the thought dawned on me –as the elevator ascended to my room at the Bellagio — that I booked a fountain-facing room. Who would book at the Bellagio and *not* request a fountain room? Possibly someone who hopes to record sound. Oh well — I’ll just time “takes” carefully to coincide with the 14.5 minutes when Andrea Bocelli is *not* belting out arias during the fountain display. I carefully crafted a fort between the twin beds which would have made Harlan proud — high-backed chairs with sheets suspended between them and the facing bed acting as good baffling for the mic, which is balanced on several Vegas and Area phone books. Just when I had a couple of fairly good test takes in the can and was feeling pretty masterful about the process, the plaintive tones of Senor Bocelli launching into his infamous aria from Don Giovanni interrupts everything. (Well — everyone strolling the Vegas strip and who have stopped to listen; transfixed, watching the water display do *not* see it as an interruption. More like a high point of their stay.) Patiently, feeling a little ridiculous camped out my tiny fort, I wait for my next opportunity, and when the cacophony of the fountains right under my window dies down and I try to fill the next 14.5 minutes with as many clean takes as possible. That is, until the loud debate between the guests in the room next to mine starts up. Something about someone wanting to sleep the hangover off, and the other loudly insisting that they hit the outlet mall. Mr. Hogan has expressed the reason behind his passion for recording remotely: he actually *can’t* relax on vacation knowing that an agent has requested an audition from him; he finds it hard to unwind with the knowledge that a client is under the gun with a deadline and needs his help to record — in short, he relaxes more knowing that the most urgent matters (and lucrative opportunities) are dealt with. I applaud that level of service, and I try my best to also be as available as possible as I can to my clients — espcially sensitive to those with crushing deadlines. But you know what I discovered? My clients are extremely accomodating and understanding when I need to leave town. I stay in contact with everyone — I have lugged that albatross of a laptop through practically every major airport in North America. They know I will record for them — in that never-changing, familiar, consistent environment of my studio — as soon as I get back. The world doesn’t come to an end; I don’t think I’ve lost a single client by delaying their recording until I return, and I feel better avoiding the pressure of attempting to return the same high-quality files I know I can crank out at home. Yes, the workload of those first couple of days back is crushing….but I also derive a sense of comfort knowing there’s lots to do when I’m back. Never a Dull Moment In Front of *This* Mic! As someone who voices the telephone prompts for a wide variety of companies, I get a front-row seat to seeing the inner workings of a wide variety of industries — most unassuming and straightforward; others so extremely bizarre, they provide great fodder for dinner party talk — and now that I’m blogging — endless material for my articles. When I first wrote about odd/unusual/interesting projects last Fall (when the blog started), I envisioned that theme of oddball projects would be a one-off or easily exhausted — luckily, I’m provided with a constant flow of projects which keep me shaking my head and perpetually entertaining friends and colleagues with amazing stories about voicing for largely unbelievable — but very real — projects. Case in point: there is an online company (who shall be nameless, as are all companies I mention in this article; I have not been paid to promote them nor have I obtained clearance to use their real names..) who — for a modest subscription fee — will break up on your behalf. Boyfriends to whom you need to give the heave-ho; girlfriends whom you need to send packing; a job which you need to resign from (but don’t actually want the discomfort of quitting face-to-face); a needy friend whom you hope to extricate yourself from once and for all — these sticky entanglements and many more can be assigned to this company, who, diplomatically; gently, and ever-so-in the third person will relieve you of your responsibility. The question which initially came to my mind was: “A *subscription* service? How often or ongoing would this need be? Wouldn’t you think that any given person might have *one* sole messy situation in their life that they would gladly pay someone to outsource: a subscription which entitles you to *several* such “get out of jail free cards“? And like a coffee card, which gets punched with every fill-up, is the tenth “breakup” free? An incredibly witty friend of mine asked if the IVR I voiced for this company was turnkey to the point of a vocal ”form letter” being drafted, not unlike an autodialer: “This is a message for (RECIEPENT’S NAME). It turns out that (SENDER’S NAME) is no longer interested in seeing you. (SENDER’S NAME) would like you to know that it’s not personal, and that it’s not you; it’s them. (SENDER) wishes you all the best in your future relationships. 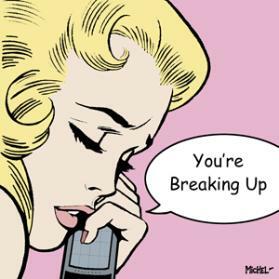 Please do not contact (SENDER‘S NAME) again.” As far as I know, it’s a live operator who “breaks up” with your former paramour/job/friend — or does it via e-mail. But it provides hours of amusement speculating on the bizarrely cold and detached nature that such an automated call would present. Nora-Ephron-film-like. Recent Bizarre Job #2: the IVR for an importer of hair. Human hair. To be made into wigs, falls, hairpieces — not a new concept. The natural human hair pieces have always been very prized — and extremely expensive. My mother was a former hairdresser who exercised huge caution in keeping her human hair wigs locked away from us yard-apes tearing through the yard in various costumes (I was usually pretending to be Cher). What gave me pause for thought for *this*client was their “feature product” — the jewel of their product line: *Virgin* Indian Hair. Yep — you read right. Apparently *highly* sought after. It made me think about all the Virgin Wool Sweaters I have in my winter arsenal and how little I care about what the sheep was up to before it became my sweater. Would “virgin” be a deciding criteria for my purchase of a hairpiece? Is the hair from a non-sexually-active woman compositionally different from a donor with a busy social schedule? More desirable/less sullied/purer? (Fewer dates = less hair product residue). And how do they screen donors carefully who might have an incentive to lie about such a thing? As with blood donors – in markets where money crosses the palm in exchange for a donation, there might be the inclination to lie about the “purity” of the sample in order to profit. The last of the interesting recent jobs was the IVR for a rather large medical marijuana collective in California– which was, for all intents and purposes — so normal and “corporate” it fairly screamed out to have fun with it. I wanted to add fake mailboxes such as: “To be connected correctly to the Cheetos hotline, press 8”, or — after all the options had been given, chirp in an exasperated voice: “If you’ve *already forgotten* which option you need…” The clients took their service very seriously, and I sensed that there wouldn’t be a positive reception to “riffing” on their material — but I desperately wanted to. I know I will have a steady influx and no shortage of interesting clients to report back on — count on similar articles in future updating you on the more colourful contracts which come my way. Voice talent — let me know about some of *your* more “unusual” projects! Next week, I’ll delve into the current phenomenon of recording voice-over on the road — many high-profile voice talent are big proponents of hauling their mics everywhere they go, but I can’t — for the life of me — make it work. Sound quality is compromised, and vacation time is for Mai Tai’s, darnit! Edie Tusor is a colleague of mine; an extremely talented lady, and someone I’m definitely honored to call my friend. Where my niche is telephony voicing, Edie excels at a wide variety of voice-over genres (including telephony), but the domain of E-Learning modules (seamlessly narrated courses people take online for degrees, training, certification or accreditation) is definitely her area of expertise — and it’s easy to see why. Edie has a wonderfully calm tone, perfect for facilitating a safe, relaxed learning environment, and hers is a timbre that is professional and affable all at the same time — we in the V/o biz all strive for that perfect mix of capable/friendly, and Edie — like all good pros — makes it look easy. When I was delving into this set of articles about recording from home, I knew Edie would provide some refreshing insight — she was one of the first people I ever heard of having a home setup to record, and (even though she’s barely in her early 20’s*) Edie is a pioneer of home recording. No matter where she’s lived, she has managed to create a state-of-the-art studio in which to work which is as separate as possible from the main living areas — not only for acoustical reasons, but also to create a healthy, dedicated space separation from home and work. She definitely commiserated with my ordeal of the furnace-cleaning truck in my last entry: she regaled me with tales of her neighbor getting a new roof and how this impacted her recording career. “Do you have any idea how many NAILS are pounded into a single roof?” she asked, when I interviewed her for this article. “The hammering went on for several days, during which we recorded most of our projects in the evening. But one day, we had a phone patch booked right in the middle of the day — so I baked a batch of muffins and asked the roofing crew if they could schedule their coffee break to coincide with our session. They were happy to oblige!” She’s a fierce cook. These were no ordinary muffins, I can promise you. Edie also touched on another aspect of home recording which other voice talent I’ve talked to have mentioned as problematic — and this can plague anyone who works alone: a feeling of isolation. Aside from e-mail and sporadic telephone contact, recording from home can be lighthouse-keeper solitary. Which — at first — may sound appealing, but can take a toll after awhile. Edie further elaborates: “I have a friend who could easily work from home but has chosen not to do so, specifically because he is not a very social person. At first, I thought this was odd, as working alone seemed a perfect fit for someone like him. As it turns out, he was worried that if he wasn’t *forced* to interact with people every day, he might literally never see anyone at all”. When one records from home, you also have only yourself to judge the quality of takes; it takes an objective ear to self-edit, to motivate oneself without external prodding, tuning out distractions, and to be the lone performer; the sole producer of the work. No water-cooler gossip, no lunch with co-workers; but on the positive side, no boss reprimands, and our staff meetings are pleasantly short and refreshingly to-the-point. Edie and I both agree: the advantages to recording from home are incalculable and are a constant source of joy for us: no morning commute, massive control over our own schedules (and rates! 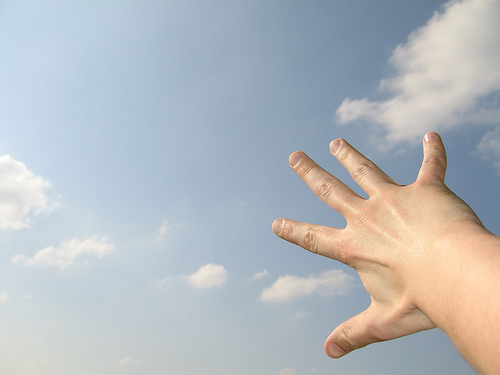 ), the ability of take care of household tasks in-between recording, and the freedom to come and go as we please. 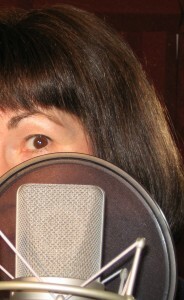 Check out Edie’s website at www.etvoiceworks.com to see her incredible list of clients, and to access her demos, which showcase a huge versatility. Next blog, I’ll update the category of “Weirdest Jobs I’ve Been Asked to Voice” — when I wrote about odd contracts I’ve had at the start of this blog last Fall, I thought that article was a one-off — luckily I have a steady influx of strange and wonderful projects I’ve voiced which never fail to shock and amaze me.